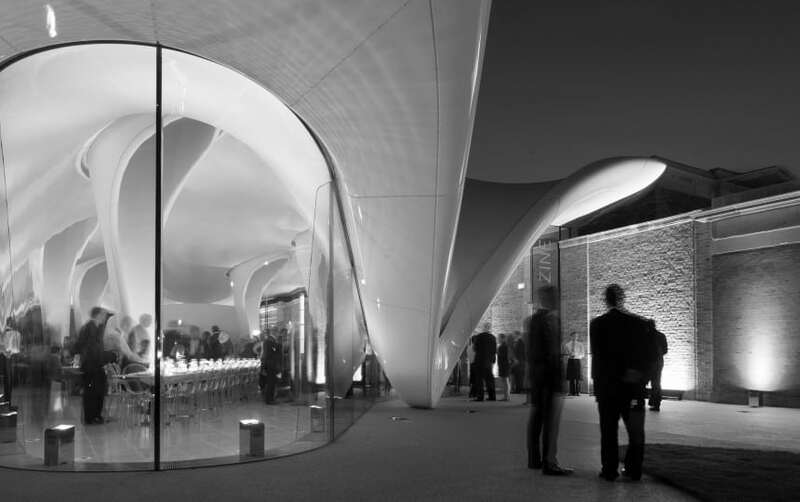 28 September marked the grand opening of another one of Zaha Hadids masterpieces: the new Serpentine Sackler Gallery. Adjacent to the 215 year old building is a dramatic new white canopy that is making headlines everywhere. Architen Landrell was pleased to be once again realising Zaha Hadids vision with fabric – having worked worked together on the London Aquatics Center. Architen’s role with the Serpentine Sackler Gallery was to design, manufacture and install the triple layer bespoke tensile fabric structure. Each layer of the fabric adds to the insulation of the new building creating a destination space that is social and vibrant. Journalist, Jay Merrick, commented about the design saying the silicone coated cloth on the underside of the roof is stitched and tailored as beautifully as a ladys shirt from Chanel in Sloane Street and the five sinuous columns supporting the roof look a bit like hollowed-out Prada high heels. From every angle, its pure undulating delight and the perfect way to update but not upstage a revered building.